Endive (Cichorium endivia) is a leaf vegetable belonging to the daisy family that can be cooked or used raw in salads. There are two main varieties of cultivated endive: Curly endive, or frisée (var crispum), and Escarole, or broad-leaved, endive (var latifolia). Here are the 7 health benefits of endive. 1. Endive is low in calories and may enhance digestion. Endive is a very low-calorie food. One hundred grams of raw endive contain only 17 calories and contains 6 grams of dietary fiber. The daily recommended fiber intake for men and women are 38 grams and 25 grams, respectively. Fiber aids in digestion by helping prevent constipation and reduce the risk of heart disease. 2. Endive can help you manage your cholesterol levels. Soluble fiber, found in the endive, may help lower total blood cholesterol levels by lowering low-density lipoprotein, or "bad," cholesterol levels. Studies suggested that fiber may have other heart-health benefits, such as reducing blood pressure and inflammation. 3. 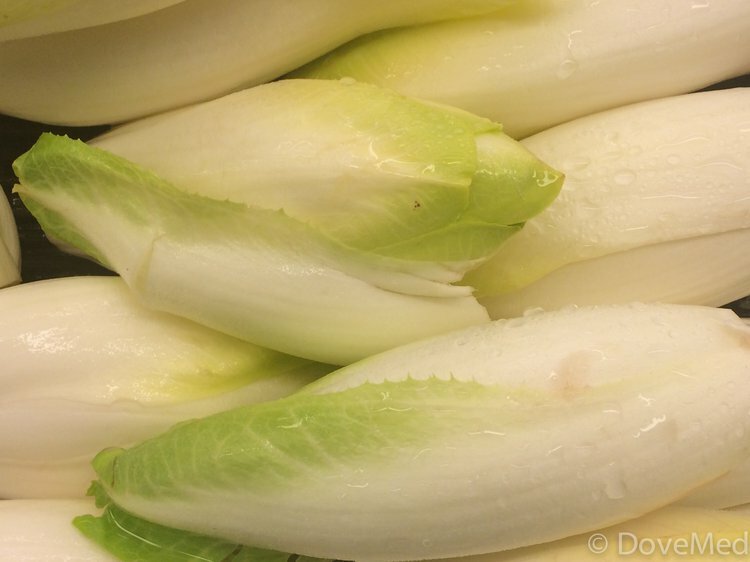 Endive can help you with diabetes and their blood sugar. Several studies have indicated that individuals with type 1 diabetes who consume high-fiber diets have lower blood glucose levels and type 2 diabetics may have improved blood sugar, lipids, and insulin levels. 4. Endive can help promote stronger bones. Endive is a sufficient source of vitamin K, which functions in retaining calcium in the bone matrix. Sufficient vitamin K consumption may also reduce urinary excretion of calcium. One cup of endive contains 289 percent of the daily vitamin K requirement. 5. Endive can help you improve your vision. Endive is a rich source of beta-carotene, which benefits eyesight. Beta-carotene can be converted to vitamin A. This can prevent people from suffering from vitamin A deficiency, itching eyes, eye ulcers, and dry eyes. One cup of endive contains 43 percent of the daily recommended needs of vitamin A. 6. Endive may help improve your brain health. Several components of endive, such as potassium, folate, and various antioxidants are known to provide neurological benefits. Folate has been known to reduce the occurrence of Alzheimer’s disease and cognitive decline. Potassium has been linked to increase blood flow to the brain and heighten cognition, concentration, and neural activity. One cup of endive contains 35 percent of the recommended daily needs of folate. 7. Endive can enhance the quality of living for pregnant women and their babies. Endive is a good source of B-vitamin complex like folic acid. Folic acid has shown to help in neural tube formation and red blood cell formation in prenatal babies. A deficiency of folic acid in pregnant women can lead to the birth of underweight infants and may also result in neural tube defects in newborns. Joshua, Z. P., & Suleiman, M. M. (2012). The effect of cooking time on the vitamin C, dietary fiber and mineral compositions of some local vegetables. Science World Journal, 7(1), 29-30. Mayne, S. T. (1996). Beta-carotene, carotenoids, and disease prevention in humans. The FASEB Journal, 10(7), 690-701. Burton, G. W., & Ingold, K. U. (1984). b-Carotene: an unusual type of lipid antioxidant. Science, 224, 569-574. Lee, P., Van der Wall, H., & Seibel, M. J. (2007). Looking beyond low bone mineral density: multiple insufficiency fractures in a woman with post-menopausal osteoporosis on alendronate therapy. Journal of endocrinological investigation, 30(7), 590-597. Houston, M. C. (2011). The importance of potassium in managing hypertension. Current hypertension reports, 13(4), 309-317. Cogswell, M. E., Zhang, Z., Carriquiry, A. L., Gunn, J. P., Kuklina, E. V., Saydah, S. H., ... & Moshfegh, A. J. (2012). Sodium and potassium intakes among US adults: NHANES 2003–2008. The American journal of clinical nutrition, 96(3), 647-657.